With the season on the line, Maci West delivered in the clutch. 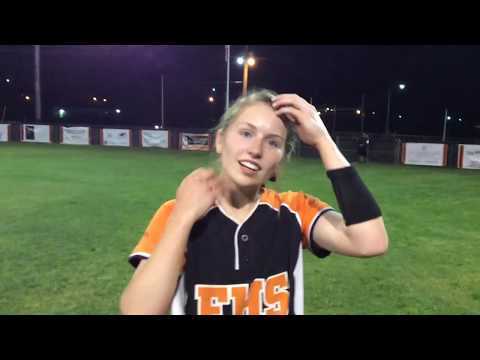 The Lady Cyclones’ senior ripped a two-run single to right field in the bottom of the sixth inning to bring Elizabethton from behind for a 7-6 win in the losers’ bracket final of the District 1-AA softball tournament Wednesday at Elizabethton’s field. The Lady Cyclones (22-13) earned a berth in next week’s region tournament and advanced to Thursday’s championship round against Unicoi County (36-7) at 5:30 p.m. A second game, if necessary, will follow. In the losers’ bracket semifinal, Sullivan East earned a tough 7-5 win over Happy Valley. East took the 6-5 lead on a two-run homer off the bat of Kayden Bawgus in the top of the fifth inning. The Lady Cyclones were going through the meat of their order in the bottom of the sixth, so the pressure was on. Macie Herrmann led off with a single and stole second base. Lauren Brickey reached on a fielders’ choice, and the Lady Cyclones had runners on second and third with nobody out. It was a similar situation to Tuesday’s game against Unicoi, where the Lady Cyclones didn’t score in a 6-5 loss. But West said she wasn’t thinking about that. In her first two at-bats, Brickey connected and crushed it. She had two home runs with the second one clearing the center field fence by a huge margin. Brickey finished 3 for 4 with three RBIs and three runs scored. West finished with two hits and two RBIs. Maggie Johnson, Kira Dillard and Herrmann each added two hits. Dillard also had a nice over-the-shoulder running catch in front of the left field fence to rob Katelyn Loudy of a hit, leading off the sixth inning. Brickey got the win in the circle. For East, Loudy had two hits and two RBIs. Jana White and Chelsea Sams also had two hits apiece. The Lady Patriots finished with a record of 21-19. Kylee Wolfe clocked a two-run homer in the bottom of the sixth inning to lift the Patriots and end the Warriors’ season. Jana White singled to get things started. Wolfe followed with a no-doubter over the left-center field fence. White had three hits for the Lady Patriots while Chelsea Sams added two, including a double. For Happy Valley, Olivia Absher and Kadie Havner led the way with each getting three hits. Claire Johnson added two hits.